But food discarded off the shelf is just one way that grub gets trashed. There's other waste along a grocery store's supply chain —rejected crops at farms, for example — that's often overlooked. So The Center for Biological Diversity and The "Ugly" Fruit and Veg Campaign recently asked the 10 largest U.S. supermarkets how they handle food waste, and gave each store's efforts a letter grade. Walmart ranked highest with a B. Kroger, Albertsons and Ahold Delhaize, the parent company that owns Food Lion and Stop & Shop, all got Cs. Costco, Publix, Whole Foods, Trader Joe's and Target all got Ds, and the German-based discount grocer ALDI got an F.
NPR asked Jordan Figueiredo, who runs the "Ugly" Fruit and Veg Campaign, a few questions about the report, and how stores could improve their approach to food waste. His answers have been edited for clarity and length. Besides donating and composting a lot of discarded food, Walmart has worked to standardize its expiration labels into two categories: "Best if Used By" for nonperishable products, and "Use By" for food that can spoil. That matters because when different products have different labels — "sell by," "best by," "use by" — most people think, "Oh, it's bad after that date." Not everybody's going to do the sniff test. I wasn't expecting Walmart to have this much going on — but that points to something important. There must also be a business case for doing this. Otherwise, why would they? For other chains that scored lower, it's not necessarily that they're not trying to reduce food waste, it's that they're not reporting what they're doing. But if they're not reporting that data, then we have no idea how effective these programs are. And something that's just done here or there isn't really meaningful. 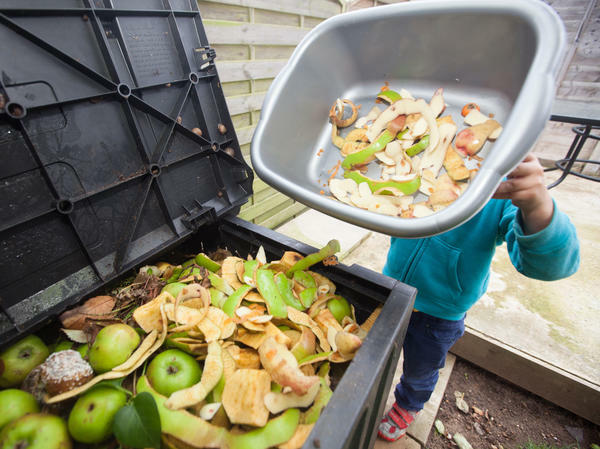 Ahold Delhaize was the only retailer to report total volume of food waste — in 2017 they discarded 5.32 tons of food for every $1.2 million in sales. Most grocery stores often report how many pounds of food they've donated. But is it all food that would've gone to waste, or is it just canned food they chose to donate? It would be great to see, publicly, somewhere on a store's website, how much food is going to landfill, being composted, and being donated. I know there's fear of losing competitive advantage if stores report too much about what they're doing, but if grocers were to report exactly how much food they're throwing in the landfill or wasting, in a bit more detail, more entrepreneurs could pop out of the woodwork to help reduce food waste with new technology or products. Misfit Juicery is creating juice products out of food that would've been wasted, and Regrained is creating bars and flour out of spent beer grain. In the U.S., grocers can cancel a produce order from a farm or a supplier whenever they want, for whatever reason, and there's no recourse. Whole crop purchasing is a commitment to work with the supplier to send food somewhere rather than just telling them, "Oh, sorry, I'm only going to purchase 70 percent of your crop this year, the other 30 percent, the produce that's ugly or weather damaged — you're on your own." In the UK, grocery stores sometimes commit to purchasing their suppliers' entire crop and figuring out what to do with all the produce, whether it's processing it or finding other outlets for it. In some cases the crops might be composted or fed to animals, but that's still more preferable than actually just leaving it to rot in a landfill or the field. Donating food and recycling is probably one of the first things most people think of to reduce food waste, but those activities were worth significantly fewer points in the stores' grades than other activities. How did you decide how grades would work? The Environmental Protection Agency came up with a food recovery hierarchy based on environmental impact ... Since preventing waste has the greatest environmental impact, we wanted to weight strategies that work on reducing food waste even before it gets to a plate or a shelf. So that's all the purchasing, delivering, transport — all the steps before food is sold at the store. Whether it's buying ugly produce, committing to purchasing whole crops, or working with delivery companies to find a place where a rejected order could go instead instead of being tossed in a landfill. Whole Foods does this, where they take produce that they pull off the shelves and then they re-purpose it into meals. That's great. The food is still being eaten, and that's the main point — we want all food to be eaten.